I had my first taste of gougeres when Central first opened. Everyone was raving about this crazy cone basket of cheesy bread that you just had to order as an appetizer. We quickly discovered gougeres are made of magic. How else could they possibly disappear in an instant? We encountered the almighty gougere again at Tartine in San Francisco, this time in a tennis-ball size serving with some spicy pepper. Yep, still heavenly. But surely difficult. Delicious, flavorful bread doesn’t come out of the oven easily. I’m sure there are special tools, craftsmanship and unique ingredients necessary. Pete Bakes finally inspired me to give the at-home gougere a try. He wrote up a fantastic recipe and wow, it might actually be doable in a mere mortal’s kitchen. Additionally gougere flavors are pliant. Most recipes will recommend using gruyere cheese and perhaps a certain herb, but you can mix it up: switch gruyere for chedder, pecorino or Swiss and it will still taste great. I made my second batch with some gouda completely by accident and they still turned out beautifully. 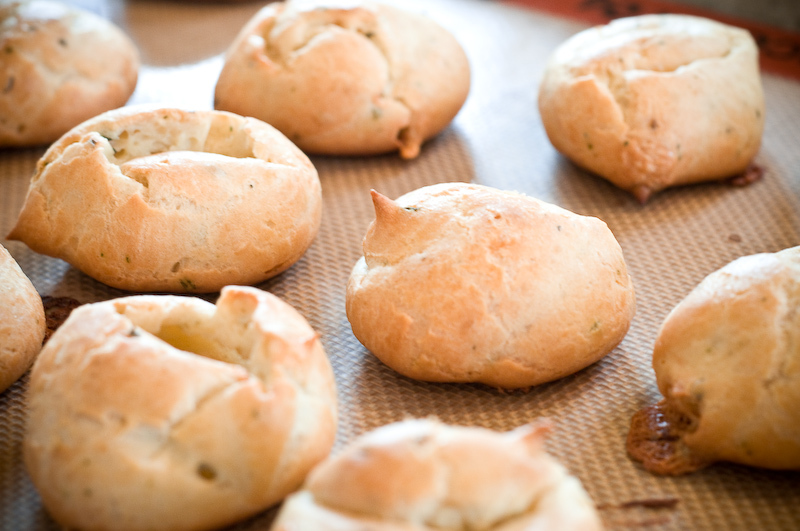 The same rule applies to herbs: gougeres can handle change as long as you keep the salty/savory balance in mind. Using the recipe from Tartine’s cookbook, I started off by making a choux which is the same paste that forms the base of cream puffs and profiterole shells. This starts off by combining nonfat milk (the book is quite clear that whole milk won’t work – it causes the puffs to deflate), butter and salt in a heavy pan until the butter has melted and the mixture comes to a “full boil.” In practice, I brought mine to a general simmer and moved on after having to skin the milk more than once. Once it is boiling (ahem, simmering), add all the flour at once and stir quickly until it is combined. This will become a sticky mass that tends to clump into one piece. Good news: That is what it is supposed to do. Now you officially have your paste. Transfer it to a large (heat resistant!) mixing bowl. If you are using a standing mixer, use the paddle attachment. Mix at medium speed adding eggs on at a time. The paste will turn from sticky to downtright shiny and gelatinous. This felt incredibly wrong to me – how could this sticky mess every become a fluffy gougere? – but that is exactly what is supposed to happen. Remove the sticky-shiny-mess from the mixer and stir in cheese and black pepper and herbs, mixing with a spatula. Place the pastries in a 350-degree oven immediately. Bake until they are puffed (about 30% larger than their original size) and golden brown. The directions suggested 25 minutes but I found 30 minutes worked better in our oven. Once browned, remove from the tray and serve, trying not to eat all of them by accident. Word on the street is gougeres are delicious served piping hot or room temperature. I have never, ever seen them stick around a table long enough to find out if the latter is true. I think it’s an urban pastry myth. *This only works if you don’t, for example, have a blog your friends read. In that case, honesty is the best policy. **The cookbook includes directions on an egg glaze topping, which I totally skipped and did not miss.